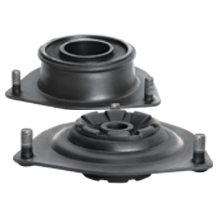 Strut mount consists of body, rubber elements, radial mounting bearing. Bolts are pressed into the body and should be used for fixing strut mount into vehicle. Strut mount body is made from cold forging alloy steel to satisfy and exceed requirements of vehicle manufacturers. Plated coating and painting protect the body from corrosion. Rubber mixture includes synthetic and natural rubber which ensures required hardness and damping properties. Ball bearing has increased hardness margin which helps to operate under high dynamic loading. Bearing contains grease enough for all service life. Increased strength of bolts pressed under higher load, bolts are designed for strut mount installation. Production of strut mounts includes using advanced steel, enforced bearing and rubber with improved specifications. Long-living due to improved body strength, special rubber mixture and enforced bearing. Designed service life at least 100 000 km mileage*.